Animal babbies are way cuter than human babbies. 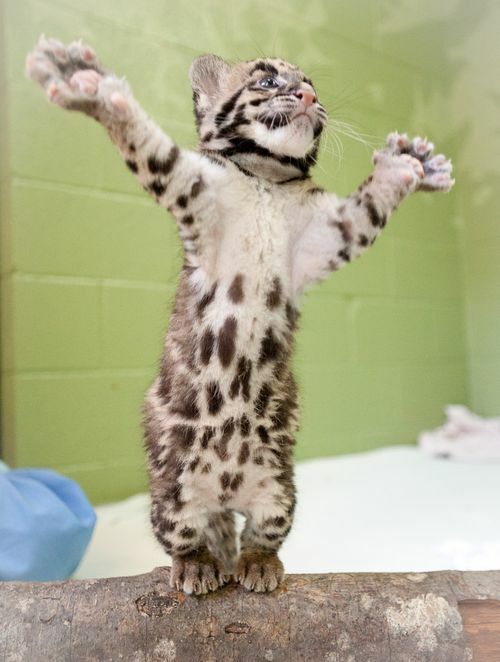 The Point Defiance Zoo and Aquarium’s 2-month-old Clouded Leopard cubs born June 14th are growing up fast and struttin’ their stuff in pictures taken Friday. Point Defiance Zoo is one of only three zoos in the country breeding endangered Clouded Leopards, along with the Smithsonian’s National Zoo and The Nashville Zoo. A pouncing pair of Snow Leopard cubs recently appeared on the scene in their main enclosure at the Twycross Zoo in Leicestershire, England. 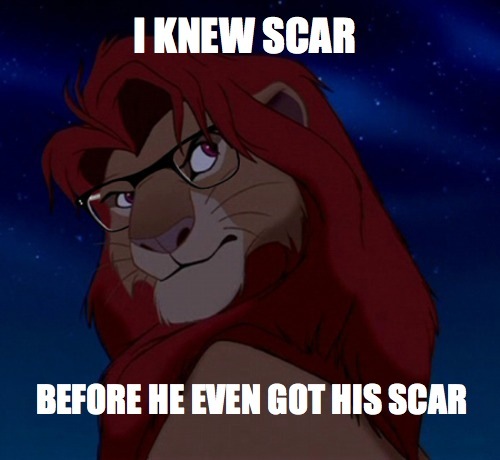 And they’ve just gotten a check up by the vets! Born in June, they are yet to be named. Parents Suou and Irma arrived at Twycross in May 2010 as part of the international breeding program. The birth of the cubs is a significant contribution to the conservation of Snow Leopards which are currently listed as endangered. Baby lion born at the zoo and I have named him Simba because I’m original like that. Sorry I haven’t been posting much this week. I’ve been really busy, going to the doctor, and also my computer charger broke so I haven’t spent much time online. I’m trying to post some stuff today during my lunch break, so STAY TUNED Y’ALL. The Aquarium of the Pacific has welcomed two male six-week-old Arctic Fox pups that are now on view in the Aquarium’s Molina Animal Care Center. The two brothers are part of the Aquarium of the Pacific’s new Arctic & Antarctic: Our Polar Regions in Peril exhibition, which gives the public the opportunity to see polar animals up close while learning about what can be done to protect their habitats. Arctic fox babies are called either pups or kits. A litter usually has about seven kits but may contain up to fifteen. The Arctic fox is an incredibly resilient animal that can live in temperatures as low as -59° F and as warm as temperatures we experience in Southern California. They are found in the Arctic and alpine tundra regions, from coastal Alaska and Greenland to Scandinavia and Russia. It survives in extreme temperatures thanks to its thick fur, furry soles, short ears, and short muzzle. During the winter months, white phase Arctic fox have white coats that serve as camouflage against the vast stretches of snow and ice in their native Arctic region. When the seasons change, their coats change to a brown or blue-gray appearance that allows them to blend in with the summer’s landscape. Blue phase fox, more common in the species’ southern habitat range, remain charcoal-colored year round. Young of each color phase may occur in the same litter. These mammals have keen hearing and normally feed mainly on rodents along with birds, and even fish. When prey is scarce in the winter, these foxes often follow polar bears to eat their leftover scraps, sometimes traveling great distances. Their average lifespan in the wild is three to six years. As an adult, an Arctic fox can weigh up to seventeen pounds. Climate change poses a threat to the Arctic fox, impacting their habitat and food sources. Consequently the International Union for Conservation of Nature has included them on their Red List of Threatened Species and on a list of ten species that are most vulnerable to the impacts of climate change. 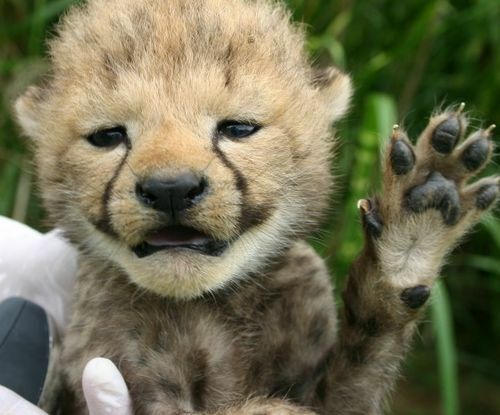 Five cheetah cubs were born at the Smithsonian Conservation Biology Institute in Virginia on May 28, 2011. Recently the animal care staff had a few brief moments to weigh and inspect the animals. The results: the cubs appear to be healthy, doing well and are very active. On average, the cubs weighed about 2 pounds (less than 1k). Keepers will continue to monitor the newborns, while giving the mother, 6-year-old Amani, privacy to bond with her offspring. Cheetahs, the fastest animals on land, are struggling to outpace threats to their survival in the wild. Because of human conflict, hunting and habitat loss, there are only an estimated 7,500 to 10,000 cheetahs left in the wild. The International Union for Conservation of Nature considers cheetahs a vulnerable species. You can read updates on the Smithsonian National Zoo’s website. I think this is my cutest baby animal post YET! 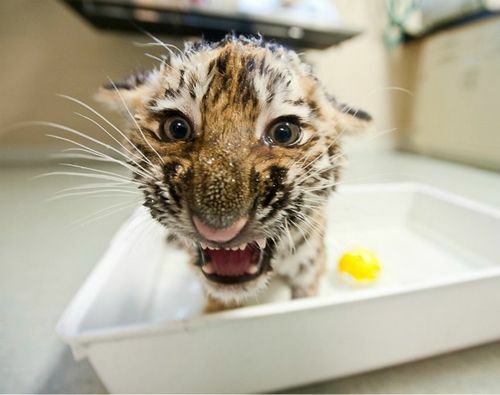 In September of 2010 the Pittsburgh Zoo welcomed a litter of little tiger cubs. Shortly thereafter, one of the cubs developed an infection and was hospitalized for weeks as Zoo vets struggled to save her life. Happily, by December the cub was happy and healthy and ready to be reunited with her siblings and mom. 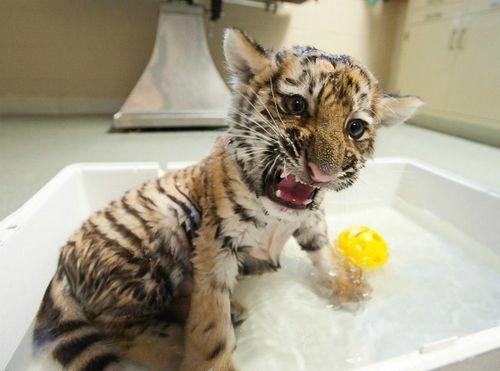 Since tiger cubs love to rough-house, keepers wrestled with the little cub to prepare her for the reintroduction. 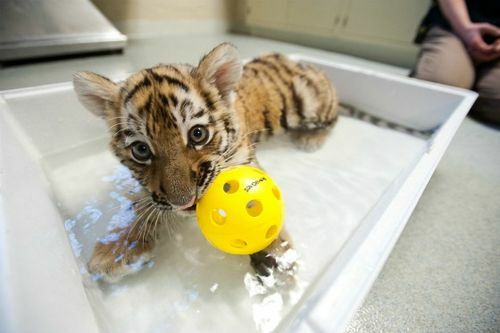 When they put out a tray of water for the active, thirsty cub, she decided to jump right in for more play time.